There were many varieties of horse-drawn carts and carriages in the 1800s. Made from wood and leather, it took great skill to build them. 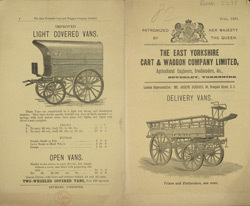 The local blacksmith would have been able to make repairs to broken carts, but specialist cart builders were in great demand. The quality of the carts built in London was thought to be far greater than in other English towns and cities.